Today is International Polar Bear Day, celebrating the world’s largest carnivore. I’ve shared my poem the “Ten-legged Polar Bear” with readers in the past, but there’s another poem I wrote about the species, which is a kind of totem for me. I wrote this poem for my oldest son, Jasper, several years ago, as he was distressing about the plight of the polar bear. He was born in Alaska and has always had a special affinity with these bears. He had heard reports of a polar bear seen swimming in circles some 60 miles from the nearest shoreline. Polar bears are found in only five countries in the circumpolar north, including the US, Canada, Russia, Greenland, and Norway. According to researchers there are only 19 wild populations of polar bears remaining — probably less that 25,000 individual bears. 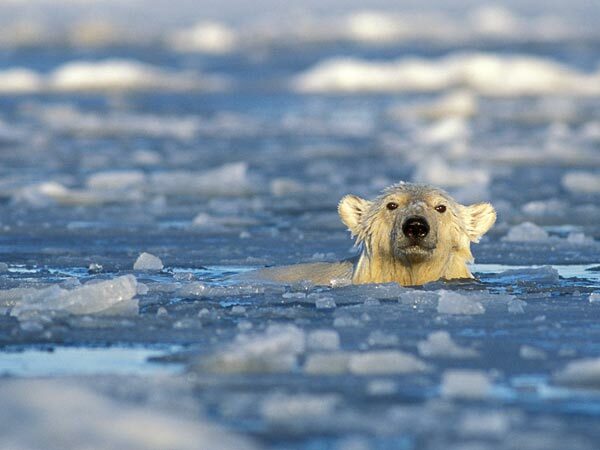 The rapid loss of sea-ice in the Arctic is the major threat to polar bears, but they are also subject to pollution, industrial development, and even poaching. finding only heavy arctic seawater, viscous oil, adrenaline ooze. up against a nimble, invisible opponent, now down for the count.